The Wild Turkey (Meleagris gallopavo) is native to North America and is the heaviest member of the Galliformes. It is the same species as the domestic turkey, which was domesticated from the South Mexican subspecies of the wild turkey. Adult wild turkeys have long reddish-yellow to grayish-green legs and a black body. Males, called toms or gobblers, have a large, featherless, reddish head, red throat, and red wattles on the throat and neck. The head has fleshy growths called caruncles. When males are excited, a fleshy flap on the bill expands, and this, the wattles and the bare skin of the head and neck all become engorged with blood, almost concealing the eyes and bill. The long fleshy object over a male's beak is called a snood. When a male turkey is excited, its head turns blue; when ready to fight, it turns red. Each foot has three toes, and males have a spur behind each of their lower legs. Turkeys have a long, dark, fan-shaped tail and glossy bronze wings. As with many other species of the Galliformes, turkeys exhibit strong sexual dimorphism. 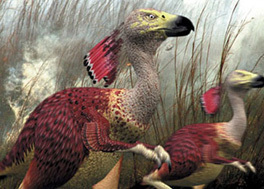 The male is substantially larger than the female, and his feathers have areas of red, purple, green, copper, bronze, and gold iridescence. Females, called hens, have feathers that are duller overall, in shades of brown and gray. Parasites can dull coloration of both sexes; in males, coloration may serve as a signal of health. The primary wing feathers have white bars. Turkeys have 5000 to 6000 feathers. Tail feathers are of the same length in adults, different lengths in juveniles. Males typically have a "beard", a tuft of coarse hair (modified feathers) growing from the center of the breast. Beards average 9 inches (230 mm) in length. In some populations, 10 to 20 percent of females have a beard, usually shorter and thinner than that of the male. The adult male normally weighs from 5 to 11 kg (11–24 pounds) and measures 100–125 cm (39–49 in). The adult female is typically much smaller at 2.5–5.4 kg (5.5–12 lb) and is 76 to 95 cm (30–37 in) long. The wingspan ranges from 1.25 to 1.44 m (49–57 in). The record-sized adult male Wild Turkey, according to the National Wild Turkey Federation, weighed 38 lb (17.2 kg). Despite their weight, wild turkeys are surprisingly agile fliers and cunning, unlike their domestic counterparts. Turkeys are very cautious birds and will fly or run at the first sign of danger. Their ideal habitat is an open woodland or savanna, where they may fly beneath the canopy top and find perches. They usually fly close to the ground for no more than a quarter mile (400 m). Turkeys have many vocalizations: "gobbles," "clucks," "putts," "purrs," "yelps," "cutts," "whines," "cackles," and "kee-kees." In early spring, male turkeys, also called gobblers or toms, gobble to announce their presence to females and competing males. The gobble can carry for up to a mile. Males also emit a low-pitched "drumming" sound; produced by the movement of air in the air sack in the chest, similar to the booming of a prairie chicken. In addition they produce a sound known as the "spit" which is a sharp expulsion of air from this air sack. Hens "yelp" to let gobblers know their location. Gobblers often yelp in the manner of females, and hens can gobble, though they rarely do so. Immature males, called jakes, often yelp. Wild turkeys are omnivorous, foraging on the ground or climbing shrubs and small trees to feed. They prefer eating hard mast such as acorns, nuts, and various trees, including hazel, chestnut, hickory, and pinyon pine as well as various seeds, berries such as juniper and bearberry, roots and insects. Turkeys also occasionally consume amphibians and small reptiles such as lizards and snakes. Poults have been observed eating insects, berries, and seeds. Wild turkeys often feed in cow pastures. They sometimes visit backyard bird feeders to search for seed on the ground or, in rare cases, croplands after harvest, to pick at the detritus left over from a threshing machine on farms. Turkeys are also known to eat a wide variety of grasses. Males are polygamous, mating with as many hens as they can. Male wild turkeys display for females by puffing out their feathers, spreading out their tails and dragging their wings. This behavior is most commonly referred to as strutting. Their heads and necks are colored brilliantly with red, blue and white. The color can change with the turkey's mood, with a solid white head and neck being the most excited. They use gobbling, drumming/booming and spitting as signs of social dominance, and to attract females. Courtship begins during the months of March and April, which is when turkeys are still flocked together in winter areas. When mating is finished, females search for nest sites. Nests are shallow dirt depressions engulfed with woody vegetation. Hens lay a clutch of 10-14 eggs, usually one per day. The eggs are incubated for at least 28 days. The poults are precocial and nidifugous, leaving the nest in about 12–24 hours. Predators of eggs and nestlings include Raccoons, Virginia Opossums, Striped Skunks, Gray foxes, raptors, Groundhogs, other rodents, spotted skunks, rat snakes, Gopher Snakes, pinesnakes, Predators of both adults and young include Coyotes, Bobcats, Cougars, Golden Eagles and (with the exception of males) Great Horned Owls, Dogs, and red foxes. Humans are now the leading predator of adult turkeys. The range and numbers of the wild turkey had decreased at the beginning of the 20th century due to hunting and loss of habitat. Game managers estimate that the entire population of wild turkeys in the United States was as low as 30,000 in the early 20th century. By the 1940s, it was almost totally extirpated from Canada and barely hanging on in remote pockets of the United States. Game officials made efforts to protect and encourage the breeding of the surviving wild population. As wild turkey numbers rebounded, hunting was legalized in 49 U.S. states (excluding Alaska). In 1973 the total U.S. population was estimated to be 1.3 million, and current estimates place the entire wild turkey population at 7 million individuals. In recent years, "trap and transfer" projects have reintroduced wild turkeys to several provinces of Canada as well, sometimes from across the border in the United States. This was the turkey species first encountered in the wild by the Puritans, the founders of Jamestown, and the Acadians; its range is one of the largest of all subspecies. The natural range covers the entire eastern half of the United States from Maine in the north to northern Florida and extending as far west as Michigan. In Canada its range extends into Southeastern Manitoba, all of Ontario, all of Quebec, and the Maritime Provinces. They number from 5.1 to 5.3 million birds. They were first named 'forest turkey' in 1817, and can grow up to 4 feet (1.22 m) tall. The upper tail coverts are tipped with chestnut brown. Males can reach 30 lbs (13.5 kg) in weight. The Eastern Wild Turkey is heavily hunted in the Eastern USA and is the most hunted wild turkey subspecies. Found only on the Florida peninsula, they number from 80,000 to 100,000 birds. This bird is named for the famous Seminole Chief Osceola, and was first described in 1890. It is smaller and darker than the Eastern Wild Turkey. The wing feathers are very dark with smaller amounts of the white barring seen on other subspecies. Their overall body feathers are an iridescent green-purple color. They are often found in scrub patches of palmetto and occasionally near swamps, where amphibian prey is abundant. The Rio Grande Wild Turkey ranges through Texas to Oklahoma, Kansas, New Mexico, Colorado, Oregon, and was introduced to central and western California, as well as parts of a few northeastern states. It was also introduced to Hawaiʻi in the late 1950s. Population estimates for this subspecies range from 1,022,700 to 1,025,700. This subspecies, native to the central plain states., was first described in 1879, and has relatively long legs, better adapted to a prairie habitat. its body feathers often have a green-coppery sheen. The tips of the tail and lower back feathers are a buff-to-very light tan color. Its habitats are brush areas next to streams, rivers or mesquite, pine and scrub oak forests. The Rio Grande Turkey is gregarious. The Merriam's Wild Turkey ranges through the Rocky Mountains and the neighboring prairies of Wyoming, Montana and South Dakota, as well as much of the high mesa country of New Mexico, with number from 334,460 to 344,460 birds. The subspecies has also been introduced into Oregon. The initial releases of Merriam’s turkeys in 1961 resulted in establishing a remnant population of Merriam’s turkeys along the east-slope of Mt. Hood and natural immigration of turkeys from Idaho has established Merriam’s flocks along the eastern border of Oregon. Merriam's Wild Turkeys live in Ponderosa Pine and mountainous regions. The subspecies was named in 1900 in honor of Clinton Hart Merriam, the first chief of the U.S. Biological Survey. The tail and lower back feathers have white tips and purple and bronze reflections. The South Mexican Wild Turkey is considered the nominate subspecies, and the only one that is not found in the United States or Canada. The Aztecs domesticated the southern Mexican subspecies, M. g. gallopavo, giving rise to the domestic turkey. The Spaniards brought this tamed subspecies back to Europe with them in the mid-16th century; from Spain it spread to France and later Britain as a farmyard animal, usually becoming the centerpiece of a feast for the well-to-do. By 1620 it was common enough so that Pilgrim settlers of Massachusetts could bring turkeys with them from England, unaware that it had a larger close relative already occupying the forests of Massachusetts. It is one of the smallest subspecies and is best known in Spanish from its Aztec-derived name, guajolote. This wild turkey subspecies is thought to be critically endangered, as of 2010. The idea that Benjamin Franklin preferred the turkey as the national bird of the United States comes from a letter he wrote to his daughter Sarah Bache on January 26, 1784, criticizing the choice of the Bald Eagle as the national bird and suggesting that a turkey would have made a better alternative. “For my own part I wish the Bald Eagle had not been chosen the Representative of our Country. He is a Bird of bad moral character. He does not get his Living honestly. You may have seen him perched on some dead Tree near the River, where, too lazy to fish for himself, he watches the Labor of the Fishing Hawk; and when that diligent Bird has at length taken a Fish, and is bearing it to his Nest for the Support of his Mate and young Ones, the Bald Eagle pursues him and takes it from him. I am on this account not displeased that the Figure is not known as a Bald Eagle, but looks more like a Turkey. For in Truth the Turkey is in Comparison a much more respectable Bird, and withal a true original Native of America... He is besides, though a little vain & silly, a Bird of Courage, and would not hesitate to attack a Grenadier of the British Guards who should presume to invade his Farm Yard with a red Coat on." This letter to Franklin's daughter was written after Congress had spent six years choosing the eagle as the emblem of the newly formed country. Franklin's disapproval of the choice of the Bald Eagle appears evident, but may have been made with mock indignation, since it is not apparent that he ever officially advocated the use of the turkey as a national emblem. The Wild Turkey, throughout its range, plays a significant role in the cultures of many Native American tribes all over North America. Outside of the Thanksgiving feast, it is a favorite meal in Eastern tribes. Eastern Native American tribes consumed both the eggs and meat, sometimes turning the latter into a type of jerky to preserve it and make it last through cold weather. They provided habitat by burning down portions of forests to create artificial meadows which would attract mating birds, and thus give a clear shot to hunters. The feathers of turkeys also often made their way into the rituals and headgear of many tribes. Many leaders, such as Catawba chiefs, traditionally wore turkey feather headdresses. Significant peoples of several tribes, including Muscogee Creek and Wampanoag, wore turkey feather cloaks. The Turkey Clan is one of the three Lenape clans. Movements of wild turkeys inspired the Caddo tribe's turkey dance.